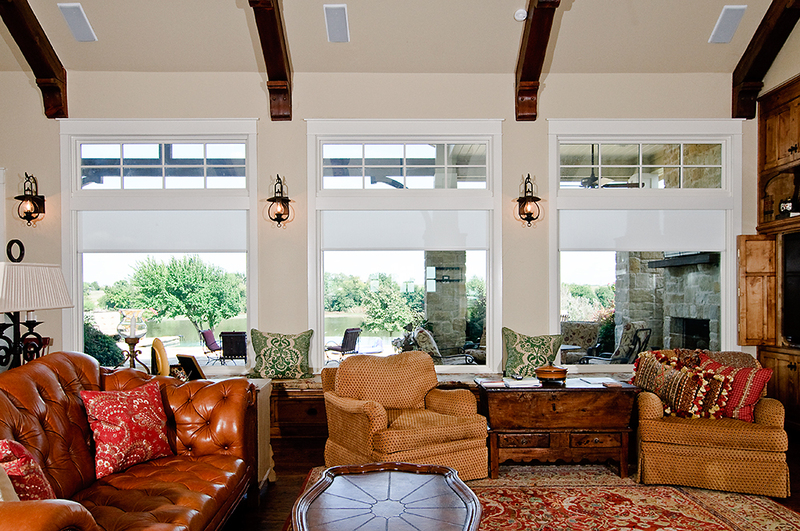 Have you ever considered adding motorized shades or remote controlled drapes to your Dallas home? Many homeowners who are considering motorized window treatments have their interest piqued by some aspect of an automated window covering solution, but aren’t quite sure if it is worth the investment. Here are five benefits of motorized shades. Convenience: Manually opening and closing all of the shades in your home is time consuming and quite the hassle. By opting to install automated shades or motorized drapeeries, you will be able to calibrate them with a centralized control system which allows the shades to lower and raise at the touch of a button or at scheduled intervals such as sunrise, or 30 minutes prior to sunset. Security: When the shades move up and down throughout the day, the home looks as if someone is there, even while on vacation. You can even have the shades in different rooms open at random times, to really give the appearance that someone is home. Reduced Energy Costs: The battle between the sun glaring on your windows and your air conditioner can really drive up your energy bill, particularly in DFW. The heat through your windows is called solar gain. The addition of a solar sensor or just smart programming can reduce this solar gain by closing the blinds when the sun is at its worse. This allows you to save energy and control glare by blocking 99% of the sun’s harmful UV rays. Protection of Furniture: The same sunshine that makes your AC unit run overtime can harm the upholstery on your furniture, causing it to fade over time. Automatically closing the blinds can protect your furniture, rugs and art work from damage and fading. Insulation: Honeycomb shades are designed to trap air. This makes them very effective at insulating your home from the cold or heat outdoors. They are available in translucent fabrics that allow you to still use natural light during the day. Lighter fabrics reflect much of the light and heat that comes into contact with them, and there are even dark fabrics, called CoolBlack, that reflect heat just as efficiently as lighter colors. Motorized shades and motorized drapes are often an overlooked piece of home technology. Now that you know the benefits that they can bring, let us design a solution that fits your needs. They come in many elegant designs that can fit the interior design of any home. Our staff can design a solution using Lutron shades that will custom fit your windows and will be installed perfectly.